I’m well aware I haven’t posted a cake/cupcake/dessert recipe for some time – 14th January to be precise. It was these very more-ish Rolo Rocky Roads, so I am sorry about that. 2019 has been full of travel and restaurant review posts meaning that baking has just taken a bit of a backstep. I do actually have quite a few recipe posts in drafts which just need photos. It’s just incredibly time-consuming as I need to bake them, photograph them…eat them. 😉 I just haven’t had the energy lately on top of all my cake orders and work to fit them in. So, I had a little think and realised I hadn’t actually shared one of the simplest recipes I know, and decided that if there’s one thing EVERYONE should know how to bake…it’s chocolate cupcakes! Adaptable, because you can fill them and top them with whatever you fancy, and delicious because…well…they’re chocolate! I say this recipe is simple as it really is. No faffing with melting chocolate or butter, no extra over-the-top ingredients, just a good old basic chocolate cupcake recipe. A year or so ago I shared a recipe for Fudgey Chocolate Cupcakes, which you can find here and they are equally as delicious, but they take a little more effort than your standard cupcake. I often use this recipe myself and swear by it for good results and a perfectly light and fluffy sponge. If I was to offer one important bit of advice, it would be to buy decent cocoa. I am a bit fussy with cocoa powder and prefer Green and Blacks or Dr Oetker. I find Bourneville is quite dry. Basically, get the best cocoa powder you can buy. So, make them, eat them, enjoy them! Let me know how you get on. Tag me on Instagram @cuppiesncream as I love seeing all your bakes. 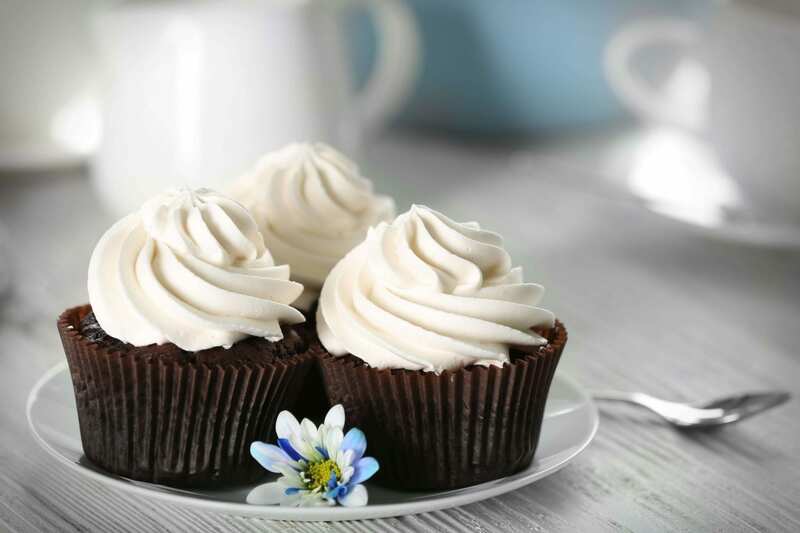 A very simple chocolate cupcake recipe. Use an ice-cream scoop to fill your cases to around 3/4 full and bake for 24 minutes (or until your cupcakes are springy to touch. Pipe swirls, add sprinkles, top with sweets! Always sieve your flour. This removes lumps but also helps introduce air to your cakes making them light and fluffy!